The late DOREEN HAWKINS (1919-2013) was born in Southampton, and her family’s answer to the desolation of the times was amateur theatricals. She made her stage debut aged four, and began her professional career at 15 playing the part of a flirtatious teenager in a play touring the north of England. From then until 1942 she worked in the punishing schedule of weekly repertory theatre in the provinces under the stage name Doreen Lawrence, making a brief and unsuitable marriage. Volunteering for ENSA in 1942, she was sent to India (via West Africa and Egypt), where she had a fateful meeting with Jack Hawkins, who was organising entertainment for the Forces there. 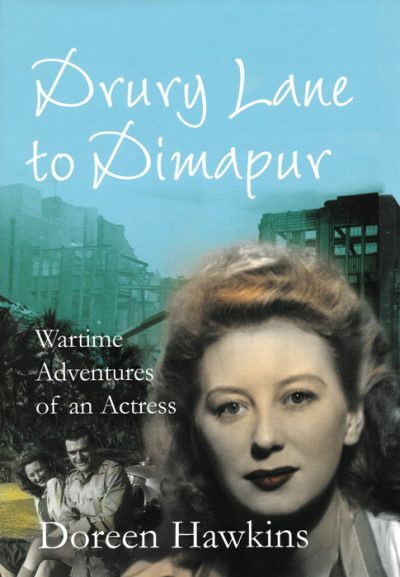 For the next two years, as a member of the Indian Repertory Company, she toured cities and battlefronts in India and Burma (including Kohima), putting on Noël Coward plays in hospitals, bases, tents and aircraft hangers. After the war, she married Jack Hawkins, and with his meteoric film career (he was twice voted the most popular actor by British audiences in the 1950s) Doreen gave up her own career to look after her husband and three children.